"A wonderful light and fruity salad for warm summer days. Feel free to adjust the ingredient amounts to fit your personal desires and tastes. Serve with your favorite vinaigrette or just leave it plain." 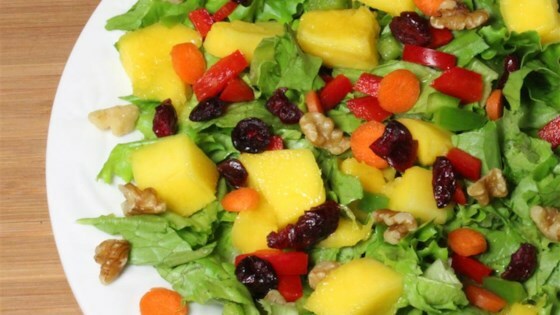 In a large bowl, gently toss together the mangoes, lettuce, walnuts, cranberries, red and green peppers, and carrot. Serve immediately. This salad is very good. It could use a salad dressing. Try using equal amounts of raspberry vinaigrette, olive oil and white vinegar.